Abstract: In recent years light-harvesting devices based on a new class of organometallic lead iodide perovskites (CH3NH3PbI3) were demonstrated to exhibit power conversion efficiencies beyond 20%, rapidly approaching the performance of commercial silicon-based modules. Besides photovoltaics, lead halide perovskites and quantum-dot/perovskite hybrids were recently discovered to possess remarkable electro- and photo-luminescent properties, highlighting them as a promising materials platform for photonic applications, such as LEDs and lasers. In this talk I will first discuss a series of fundamental studies of single-crystalline perovskite materials, including investigations of their electronic structure, carrier dynamics, and photophysical properties. I will then present some recent developments of new highly-luminescent perovskite compounds and perovskite-based composite materials and hierarchical structures, and provide a few examples of how they can be tailored and functionalized for specific optoelectronic applications, and in particular for light emission technologies. 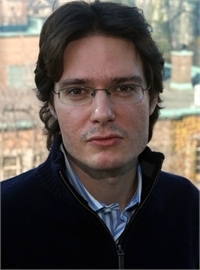 Biography: Riccardo Comin joined MIT as an Assistant Professor of Physics in July 2016. He completed his undergraduate studies at the Universita’ degli Studi di Trieste in Italy, where he also earned a M.Sc. in Physics in 2009. Later, he pursued doctoral studies at the University of British Columbia, Canada, earning a PhD in 2013. Prior to MIT, Comin was an NSERC postdoctoral fellow at the University of Toronto. For his work using synchrotron-based X-ray scattering methods on oxide-based quantum materials and halide-based optoelectronic materials, Comin received the Bancroft Thesis Award (2014), Fonda-Fasella Award (2014), John Charles Polanyi Prize in Physics (2015), McMillan Award (2015), and Coles prize (2016). Professor Comin's research couples the design of new materials possessing novel, technologically-relevant quantum properties, with the fundamental study of the driving force behind new phases of matter or unconventional functionalities. Examples include both systems with exquisitely quantum behavior, such as high-temperature superconductors or multiferroics, and systems with non-trivial and tunable structure-property-function relationships such as halide-based perovskite semiconductors. The Comin group engages in the synthesis of single-crystalline materials, as well as thin films and heterointerfaces, and uses photonic probes such as X-ray or Raman scattering to unearth the fundamental and often elusive properties of new quantum materials.